Hot Stone Massage, ancient healers believed that our bodies had key energy points that when blocked or damaged were the cause of our pains and illnesses. When energy cannot flow properly throughout the body, it leads to muscles aches, cramps or sickness can occur. This is one of the world’s oldest massage therapy techniques. Practiced by cultures all over the world, it may be just what you need to loosen up those tight muscles, banish back and neck pain, and feel healthier and more balanced than you have in years! Imagine that your body has a highway system running through it. Just like a real highway that has off-ramps and turnpikes, your body has key areas where energy flows from one part to another. When a traffic jam happens, energy is blocked, muscles cramp and this results in pain. Hot stone massage therapy involves heating up smooth rocks and placing them on these key points on the body. The hot stones improve circulation of both blood oxygen and nutrients, and calms the nervous system, allowing energy to flow better. The massage therapist may add pressure onto these stones to increase their effectiveness. Hot stone massage therapy can be used anywhere on your body: Head, Neck, Arms, Shoulders, Hands, Chest, Back, Legs, and Feet. The number of treatments required is entirely up to you and there are no limitations. Many clients make it part of their routine to come in for a relaxing massage to undo a week’s worth of stress. 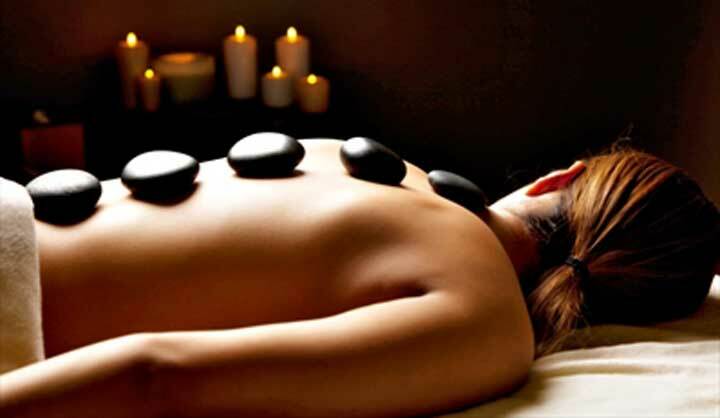 Visit our Mississauga spa and massage clinic to learn more about hot stone massage. Or learn about other spa services.